Centers in the central nervous system control the fundamental respiratory pattern. This pattern is modified by special receptors that detect changes in the blood’s chemical composition. Nervous Control Regulation of respiration is a complex process that must keep pace with moment-to-moment changes in cellular oxygen requirements and carbon dioxide production. Regulation depends primarily on a respiratory control center located partly in the medulla and partly in the pons of the brain stem. The control center’s main part, located in the medulla, sets the basic pattern of respiration. This pattern can be modified by centers in the pons. These areas continuously regulate breathing, so that levels of oxygen, carbon dioxide, and acid are kept within normal limits. From the respiratory center in the medulla, motor nerve fibers extend into the spinal cord. From the cervical (neck) part of the cord, these nerve fibers continue through the phrenic nerve (a branch of the vagus nerve) to the diaphragm. The diaphragm and the other respiratory muscles are voluntary in the sense that they can be regulated consciously by messages from the higher brain centers, notably the cerebral cortex. It is possible for a person to deliberately breathe more rapidly or more slowly or to hold his or her breath and not breathe at all for a while. In a short time, however, the respiratory center in the brain stem will override the voluntary desire to not breathe, and breathing will resume. Most of the time, we breathe without thinking about it, and the respiratory center is in control. Figure 14-1 Overview of respiration. In ventilation, gases are moved into and out of the lungs. 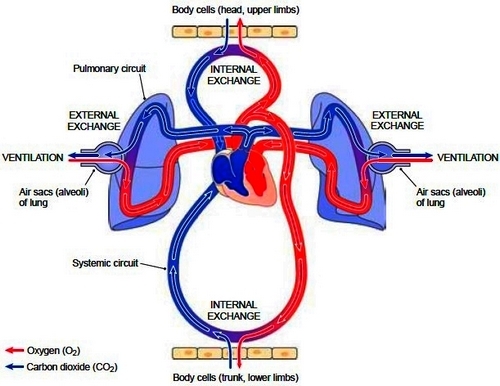 In external exchange, gases move between the air sacs (alveoli) of the lungs and the blood. In internal exchange, gases move between the blood and body cells. The circulation transports gases in the blood. at the level of the central chemoreceptors. When the carbon dioxide level increases, breathing must be increased to blow off the excess gas. Oxygen only becomes a controlling factor when its level falls considerably below normal. In hyperventilation, an increased amount of air enters the alveoli. This condition results from deep and rapid respiration that commonly occurs during anxiety attacks, or when a person is experiencing pain or other forms of stress. Hyperventilation causes an increase in the oxygen level and a decrease in the carbon dioxide level of the blood, a condition called hypocapnia. The loss of carbon dioxide increases the blood’s pH (alkalosis) by removing acidic products, as shown by the equation cited previously. The change in pH results in dizziness and tingling sensations. Breathing may stop because the respiratory control center is not stimulated. Gradually, the carbon dioxide level returns to normal, and a regular breathing pattern is resumed. In extreme cases, a person may faint, and then breathing will involuntarily return to normal. In assisting a person who is hyperventilating, one should speak calmly, reassure him or her that the situation is not dangerous, and encourage even breathing from the diaphragm. In hypoventilation, an insufficient amount of air enters the alveoli. The many possible causes of this condition include respiratory obstruction, lung disease, injury to the respiratory center, depression of the respiratory center, as by drugs, and chest deformity. Hypoventilation results in an increase in the carbon dioxide concentration in the blood, leading to a decrease in the blood’s pH (acidosis), again according to the equation previously mentioned. Normal rates of breathing vary from 12 to 20 times per minute for adults. In children, rates may vary from 20 to 40 times per minute, depending on age and size. In infants, the respiratory rate may be more than 40 times per minute. Changes in respiratory rates are important in various disorders and should be recorded carefully. To determine the respiratory rate, the healthcare worker counts the client’s breathing for at least 30 seconds, usually by watching the chest rise and fall with each inhalation and exhalation. The count is then multiplied to obtain the rate in breaths per minute. It is best if the person does not realize that he or she is being observed because awareness of the measurement may cause a change in the breathing rate. Some Terms for Altered Breathing The following is a list of terms designating various abnormalities of respiration These are symptoms, not diseases. Note that the word ending -pnea refers to breathing. * Hyperpnea refers to an abnormal increase in the depth and rate of respiration. * Hypopnea is a decrease in the rate and depth of breathing. * Tachypnea is an excessive rate of breathing that may be normal, as in exercise. * Apnea is a temporary cessation of breathing. Short periods of apnea occur normally during deep sleep. More severe sleep apnea can result from obstruction of the respiratory passageways or, less commonly, by failure in the central respiratory center. * Dyspnea is a subjective feeling of difficult or labored breathing. * Orthopnea refers to a difficulty in breathing that is relieved by sitting in an upright position, either against two pillows in bed or in a chair. * Kussmaul respiration is deep, rapid respiration characteristic of acidosis (overly acidic body fluids) as seen in uncontrolled diabetes. * Cheyne-Stokes respiration is a rhythmic variation in the depth of respiratory movements alternating with periods of apnea. It is caused by depression of the breathing centers and is seen in certain critically ill patients. * Cyanosis is a bluish color of the skin and mucous membranes caused by an insufficient amount of oxygen in the blood. * Hypoxia means a lower than normal oxygen level in the tissues. The term anoxia is sometimes used instead, but is not as accurate because it means a total lack of oxygen. * Hypoxemia refers to a lower than normal oxygen concentration in arterial blood. * Suffocation is the cessation of respiration, often the result of a mechanical blockage of the respiratory passages.